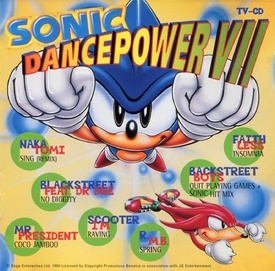 Sonic Dance Power VII is a the penultimate compilation album of techno, pop and dance songs released in the Netherlands and Benelux. Though it features the Sonic the Hedgehog brand on the packaging, none of the songs have any relation to Sonic or any other SEGA property. Like the previous installment, there was a separate track list for the album in other parts of Europe. The Benelux and later Netherlands release comes with a free Sonic & Knuckles Collection demo disc.